The talk given by artist Mariano Giraud connected science and art both technically and conceptually. We were captivated by his descriptions of 3D printing, theories of the origin of life and the great innovators who inspire him in his work. Mariano is not only a friend of the school, but also an eloquent teacher. Thank you for coming! Although a first glimpse of his work may indicate otherwise, Mariano Giraud considers himself a fairly traditional artist. Over the generations, he explained to us, our intrinsic curiosity and the fundamental questions that we ask ourselves don’t really change. What does change is the way we express these questions, and the style and technique with which we work through them. With that being said, Mariano’s technique is ultra-modern. He uses different kinds of plastics and resin to create digital sculptures with 3D printers and also works with installations and projections. To make the sculptures, he first creates the instructions for the design in a computer file. 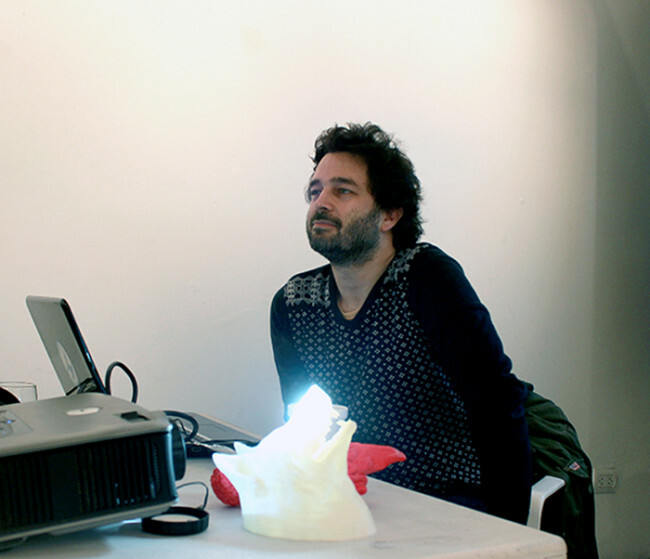 Then the photosensitive 3D printer projects light to constructs the sculpture layer by layer. It can take hours or even days to print. Mariano explained that his generation grew up as computers were also “growing up,” and so now is driven to create art using modern technology, inspired by the people who developed those technologies. Mariano also shared with us some of these individuals whose work and ideas drive him to create. Among them are scientists like Charles Darwin and Carl Sagan; programmers like Richard Stallman, Ada Lovelace and Alan Turing; and skateboarders like Rodney Mullen. He chooses theories that appeal to him and develops them artistically. The origin of life, space exploration and evolution have all been important themes in his work. As an atheist, Mariano said, creating art gives value and meaning to his existence.